Bart Lybaert shoves all in from the button and the blinds fold. Ben Yu opens the action with a raise to 140,000. 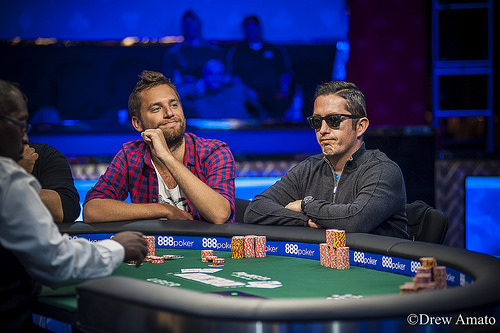 Bart Lybaert shoves all in for 620,000 and Hugo Perez asks for a count. He hears 620,000 and goes all in. Yu folds. Perez has against the of Lybaert. The board runs out and Lybaert doubles up. There is a dead button. Christian Blech raises to 150,000 from the hijack and and Karl Held calls from the small blind. The flop is and Held check-calls 135,000 from Blech. The river is the and Held bets 175,000. Blech folds. There is a dead small blind. Christian Blech raises to 200,000 from the cutoff and gets no action. 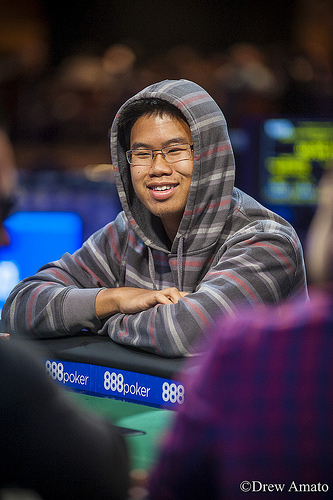 Ben Yu moves all in from the small blind for 465,000 and Nitis Undornpim calls all-in from the big blind for approximately 400,000. The board runs out to give Yu the pot and eliminate Udornpim. Hugo Perez raises to 125,000 from the cutoff. Christian Blech reraises all in from the small blind for 425,000, and Perez folds. Ben Yu moves all in from under the gun for 385,000 and wins the blinds and antes. Bart Lybaert raises to 125,000 from the button, Hugo Perez re-raises to 275,000 from the small blind, and Lybaert folds. 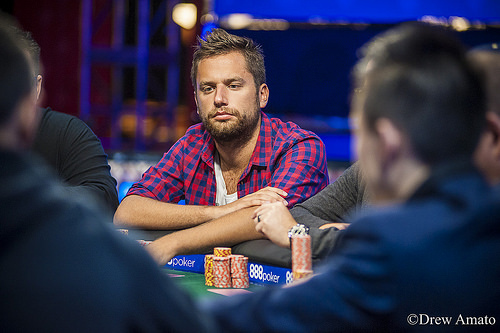 Bart Lybaert raises to 150,000 from the small blind and Hugo Perez folds in the big blind. Bart Lybaert gets a walk. Ben Yu raises all in for 175,000 form the button and Karl Held calls from the big blind with , trailing Yu's . The board comes down , giving Yu a pair of jacks to double up. Christian Blech raises to 125,000 from the button and collects the blinds and antes. Hugo Perez raises to 90,000 from the cutoff and gets no action. 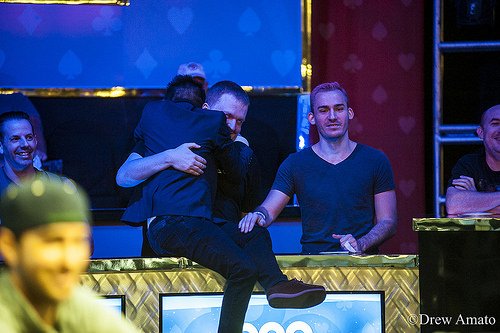 Karl Held raises to 100,000 from middle position and Bart Lybaert, who is next to act, moves all in for about 370,000. Held calls. The board runs out and Lybart's kings hold for the double-up. Hugo Perez calls from the small blind and Kyle Julius raises to 140,000. Perez folds. Hugo Perez gets a walk. Hugo Perez opens to 90,000. Karl Held reraises to 220,000 and Perez folds. Bart Lybaert shoves all in from under the gun and everyone folds.